Murray was selected by the Baltimore Orioles in the third round of the amateur draft in 1973. He was sent off into the Orioles farm system where he had several very successful seasons. He was called up to the majors in April of 1977 for the Orioles and played 160 games for the team in his first season. He did well enough to earn the American League Rookie of the Year award and hit .283 and belted out 27 home runs. Not bad for a rookie. While many players who start out that hot often have a second-year slump, this was not the case for Murray. He just kept racking up the numbers and becoming a steady and reliable player. 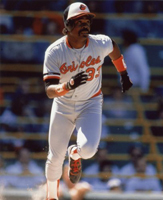 During his time playing for Orioles, from 1977 through 1988, he averaged 28 home runs and 99 RBI and was a candidate for league MVP each year. During the 1983 season with the Oriole he hit .306, .393 and .538 with 110 RBI and 33 home runs - his best season ever. He also became beloved by Orioles fans and was renowned for his clutch hitting, often batting in much-needed runs to the crowd chants of "EDDIE - EDDIE." He was traded to the LA Dodgers in 1988. He had three very productive years there despite switching leagues. In 1990 he actually led the major leagues in hitting, but ended up not winning the National League MVP. He went on to also play for the New York Mets from 1992 - 1993. He would then play for the Cleveland Indians from 1994-1996 before going back to the Orioles for a single season in 1996. He would then play single seasons for the Anaheim Angels and Los Angeles Dodgers, before retiring in 1997. 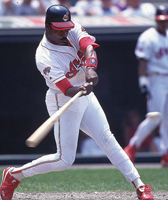 Even though he was not standing at the plate any longer, he kept active in the major leagues and became the hitting coach for the Cleveland Indians from 2002 to 2005. He was also hitting coach with the Dodgers up until 2007. He was with the Indians when he was inducted into the Hall of Fame. Murray would end his career with a batting average of .287 and 3,255 hits. He earned his entry into the 500 Home Run Club by belting out 504. He also had an impressive 1,917 RBIs. During his years playing he was an eight-time All Star and World Series champion in 1983. He also won the Gold Glove for fielding three times and won the Silver Slugger Award three times. In 1977 he was the Rookie of the Year and he had his number, 33, retired by the Baltimore Orioles.